Have any of you played with Wordle? I've been experimenting with a little project that will store the novel's text in a database for purposes of analysis, searching, etc., and while I was working on it I thought that this might be fun. 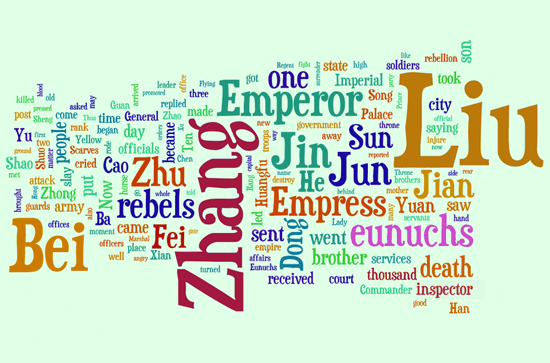 What kind of Wordle can you make out of the Three Kingdoms period? I'll share any I make here. Romance of the Three Kingdoms, Chapter 1. Mostly generated from the natural settings at Wordle. I adjusted some colors after the fact and applied a slightly yellow haze in Photoshop. I might make one of these from time to time, chapter by chapter. I want to make one for the whole novel. This is pretty cool. Does it automatically sort words that appear close to each other? I noticed that "Three Brothers" happen to be right next to each other in the Wordle and was wondering if it was a coincidence. Kong Wen wrote: This is pretty cool. Does it automatically sort words that appear close to each other? 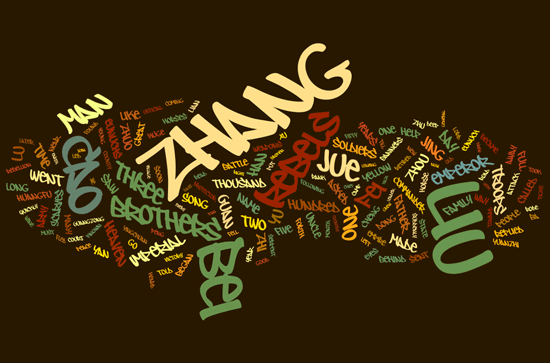 I noticed that "Three Brothers" happen to be right next to each other in the Wordle and was wondering if it was a coincidence. As far as I can tell, it doesn't. It also doesn't recognize 'Cao Cao' as 'Cao Cao' in any way, for example. It just recognizes it as 'Cao', twice. I basically just dumped the entire text of chapter 1 into the Wordle form, adjusted fonts and presentation to represent, to some degree, chaos, and the used an option to re-create the Worldle with those settles again and again until I got something which reminded me of the Yellow Turban Rebellion and war waged in retaliation. 'Three Brothers' appears close together because that's something I was striving for. Romance of the Three Kingdoms, Chapter 2. Figured I'd toss in one more. I was thinking about some of the chapters like the Battle of Red Cliffs and how to represent them. This seems kinda fun. Odd how something little like this can inspire a much larger project at KMA. 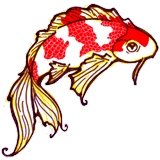 I've thought of creating a Chapter reference which includes all sorts of goodies for each chapter in the novel. There's already cool information in the encyclopedia to draw from. I definitely like the font/style of Chapter 2 better than Chapter 1. Kong Wen wrote: I definitely like the font/style of Chapter 2 better than Chapter 1. Really? I thought chapter 1 was pleasantly chaotic. I think part of what inspired the chapter 2 format was my memories of this scene from Great Conquest: Romance of the Three Kingdoms—the scene in which Zhang Fei wakes up in the pleasant little village and complains about how it is 'perfectly boring'. That combined with all the other stuff which took place in the chapter. Then I tried to pick a font which reminded me of scheming. James wrote: Really? I thought chapter 1 was pleasantly chaotic. I like the chaotic arrangement, but the font is too roundy or something. Kong Wen wrote: I like the chaotic arrangement, but the font is too roundy or something. I find the font reminiscent of Chinese brush writing. The one for Chapter 2 is more bookish.